Breathe continues Yung’s examination of our unrequited spiritual resolve and truth through quasi-divinatory figures such as a Buddhist Monk- Ordained, Interview with A Tarot Master; Phillipe Camoin, creator of the Tarot De Marseille deck to a face reader and Feng Shui expert. In Breathe, onlookers become part of the instructional video as they follow a meditative breathing exercise. 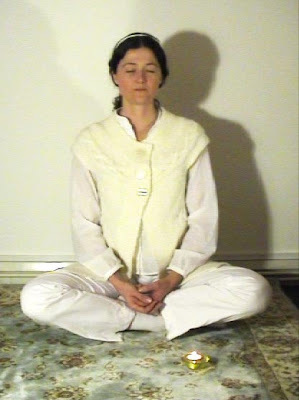 The mesmeric, guiding mantra conducted by a follower of Sri Chimnoi Meditation, herself a ‘searcher’, sat crossed-legged, looks out to the curious viewer and invites transplantation into a timeless present. ‘Focus on your breath… imagine you’re breathing in infinite peace”- chance to enter an elevated consciousness, towards divine soul-mind oneness. The associated paraphernalia; candle, opulent carpet, lowly dubbed Ohm chanting- point to the body’s proposed chakra energy flows and envelops viewer into possible warming mindfulness reinforcing Yung’s sound interactive light works- Passings and Corona. The equally seeking onlooker may ‘feel the river of joy coming into you’, they are afforded a much sought time and space to release confines of external time, to undo internal conflict and outlet for blockages ‘when you breath out, imagine you are exhaling all your sadness, frustration and depression’. The time spent offers reassurance that hope and meaning can be located from within ‘love and joy are always in your heart… waiting for you to discover them’. However, there is a disquietude threatening exacerbation of our internal anxiety as we recognise such reprieve as a mere interlude to daily living, unless greater transformation is risked throughout the way the societies organize themselves.